My mother Asharani, the last daughter-in-law of Ex-State Tigiria’s last Rautroy (hereditary chief of the royal army till the State merged with India), the revered Late Jagabandhu Rautroy Pattanayak and wife of late Nishanatha Pattanayak, who despite being a member of a Mahatrana privileged family (hereditarily privileged to possess property without paying any royalty to the King), had given all the support for the Prajamandal Andolana (freedom movement of the inhabitants of Princely States), has breathed her last on the Hospital bed in the evening of 16 December 2011 at the age of 91. She succumbed to Gastric Adenocarcinoma, that had, by the time of diagnosis, after many weeks wasted in Kalinga Hospital without any relevant investigation, had spread into an incurable stage. She was motherliness incarnate. She was simplicity incarnate. Aristocratic in mentality, she was most compassionate in reality. All my childhood friends and all the children of our Sahi (neighborhood) were seeing in her the most concerned and affectionate mother that their experience could prompt them to comprehend and my childhood teachers who were coming to our house to teach me were also having the same feeling, as my revered teacher Sri Bira Kishore Mishra has told me several times. She was a mother to all the labors that were working in our agricultural fields and engaged in household works. Never had it happened that a poor person had wanted any help from her, but was denied. As I remember my days in Tigiria, if a beggar was seemingly starving, she was not only giving alms, but also feeding him/her with utmost concern, care and affection. Plants and animals in our compound and surrounding were one with her being always. The kindness and emotion with which they were being treated can be of seldom similarity elsewhere. But she was of a typical Gadjati (paradigmatically highlander) personality that had, by birth, made her absolutely fearless and completely free of hypocrisy, and therefore, in her expression of appreciation or disapproval of any matter, she was honest, specific and sharp. She was an early riser and a tireless user of time till retiring for the night. She had had no schooling, because the village Ganjara she was born to, (you may know of Ganjara from my poem first published in ‘Eureka‘ and compiled in my book on the anvil, ‘Ketebele Kemiti) had no school. A traditional Abadhan (Alphabet teacher) belonging to the astrologer caste had taught her up to the ability of reading Jagannatha Das’s Oriya Bhagavata and Sutra (formula) of basic arithmetic enough to keep accounts of domestic expenditures. 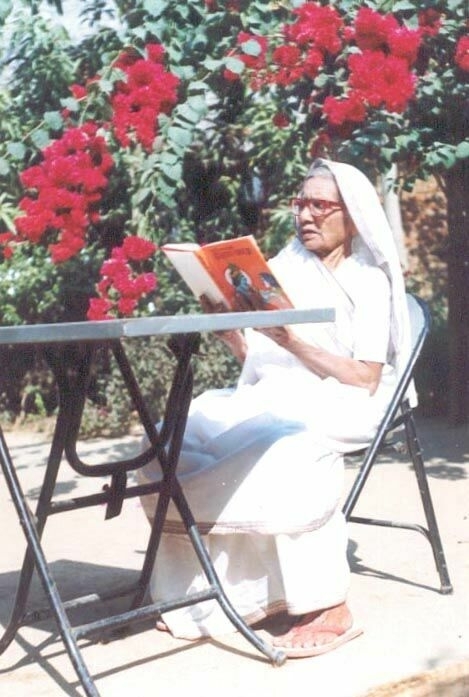 But she had developed an enviable reading habit and whenever not busy in work in the home or garden, she was busy in reading poems, stories and Purans. Reading language newspapers every morning and watching Oriya news channels in every evening was one of her hobbies. But the highest of happiness she was having was in giving return gifts for every favor done to her by anybody at anytime. Even in Hospital bed, she had not given up this practice. Before she had become too shrunk to utter words, she had wanted me to give some lemons from our garden to a Doctor that had treated her quite kindly and had asked a nursing sister as to which fruit she likes most and knowing of her preference for mangos, she has given instruction to me and to my brothers to give her the best of mangoes from our garden, when the season comes. Such and much more was my mother Asharani. She gave a very brave fight against the pernicious disease. And, she endured the menacing pains sans any remission. Lest we in the family fall deep into worries, she was keeping her eyes closed while silently trying to suppress the tormenting aches that cancer was giving her. And, till her last moment, the dreaded disease that ate away her body, had failed to diminish her composure. The Doctors knew that they cannot cure her. It was known that medical science cannot save her life. Yet, she was not led to peace, as the Laws of our land do not allow a terminally ill and incurable patient to die with dignity. Her brooding about why this happens and her unuttered reaction that her tired glances were sending into my fingers had made me cry out on the screen of my iPhone on the corridors of the Hospital, in a state almost of abstraction. I think to share one of such cries with you, because I feel, no terminally ill person of my mother’s age and condition should be compelled to suffer so severely for so many days till death terminates her breathe, when medical science pronouncedly fails to ensure a cure. So, here is the poem – the reflection of my mother’s silent brooding – for you to cogitate her unuttered question and to speak out your mind, if you like, on whether or not there should be a Law to lead any incurable and terminally ill senior citizen to peace with dignity. The words may be mine, but mingling must be in them, the helpless cries of all the children bereft of the beloved parents in similar situations. Let us rise above dogmas relating to life, in interest of dignity of life and on the basis of absolute love for the ones we love the most. Yet for the drips you need a way! Needles have ushered in thrombosis in them. Yet you go on making more punctures ignoring my pain. And contributed my might to the society of ours. A simple citizen I always am, a content housewife. Or by the spurious medicines available under prescription. Have I no right to be led into peace with dignity? It is high time that a clear and profound public opinion be made on the matter of ” RIGHT TO A DIGNIFIED DEATH ” when doctors and relatives as well must exercise their “common sense” more than their love/ability to pay for the expenses at the death bed. I still suffer the trauma of seeing my beloved father, an upright tuff hard working man, going through hell the last 3 weeks of his beautiful mature life of 86 years, just for the whim of the surgeon and the private hospital’s last moment emotional soft timing exploitions. The feelings are genuine and the medical lingering of unnecessay pain in the name of health care is not really justified. But then ……..??? My Dear Subash Babu, I was shocked after getting the Sad News from My Patron Mr.Prasanta Patnaik. Instantly I have published the story.Here is the link for you. editor in Chief , Orissabarta Online.